Everybody loves feel-good stories about people working really hard and accomplishing their goals, but sometimes a story about people working really hard and failing spectacularly can be just as enjoyable. It all comes down to the idea of “schadenfreude,” which is the German word for taking pleasure from someone else’s misfortune. Modern society and most religions would look down on you for indulging that impulse too often, but occasionally it can be very satisfying to scratch that itch. Every single one of those dominos is your parents telling you to move out, your manager at Quiznos firing you for not washing your hands, or those nerds in high school who wouldn’t let you join the Dominos Club because of your shaky hands. See where they’ve all ended up? On the floor, in a big dumb pile. 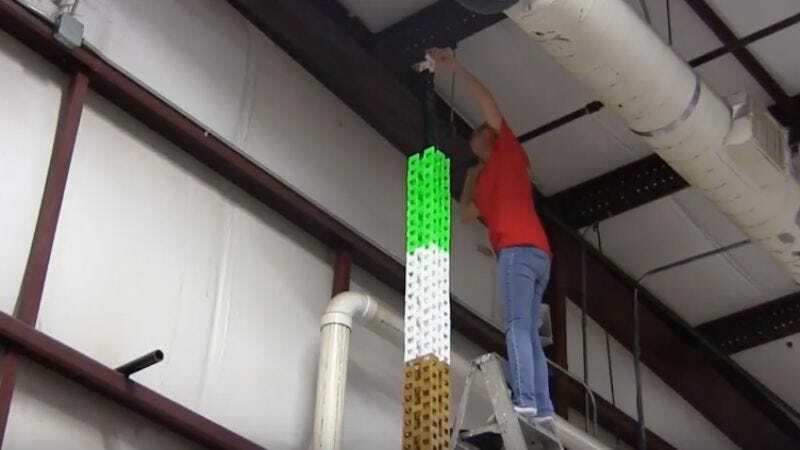 To be fair, Hevesh5 and Austrian Domino Art seem like perfectly nice people, and they did break the record for the largest domino tower in the United States, so maybe this isn’t really a victory for the losers of the world.